John Taylor Doolittle was born in Glendale, California on October 30, 1950. He is married to Julia Harlow and is father to son, J.T. and daughter, Courtney and in 2005 became a grandfather for the first time to Lorelai Taylor Doolittle. He graduated with honors with a Bachelor of Arts in History from the University of California, Santa Cruz. He also has a law degree from McGeorge School of Law, University of the Pacific, in Sacramento, in 1978. Doolittle served as a Republican member of the United States House of Representatives from 1991-2009, representing the 4th District of California. During the 110th Congress, Doolittle maintained the seat he first gained in the 107th Congress on the powerful Appropriations Committee, as well as its Subcommittees on Energy and Water Appropriations and Interior Appropriations. During the 109th Congress, Doolittle was elected Vice-Chairman of the Energy and Water Appropriations Subcommittee and was also appointed to the Agriculture Subcommittee. Also, for the 108th and 109th Congresses, Doolittle was elected as the Secretary of the House Republican Conference, the sixth highest ranking elected position in the House Leadership. During that same period, he also was a member of the Committee on House Administration. Doolittle also continued to be one of only a handful of Deputy Whips in the Republican Conference, a position he first gained at the start of the 104th Congress. The Whip organization, a critical arm of the conference leadership, is in charge of marshaling votes for passage of important legislation that reaches the House floor. John, while a freshmen, was a member of the group known as the Gang of Seven who exposed the House check-bouncing scandal, pressed for full disclosure of all overdrafts, and brought national attention to the issue of congressional reform. He was Co-founder of the Conservative Action Team, now known as the Republican Study Committee, the largest and most effective organization among House Republicans. Prior to his U.S. House service, in a 1980 race for the California State Senate, Doolittle, then 29, stunned many by narrowly defeating Democrat Al Rodda. He won another term by defeating Ray Johnson, a Republican turned independent from Chico. Doolittle won re-elections in 1986 and 1988. 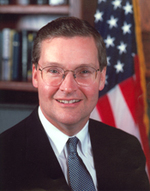 From 1987 to 1990, he was chairman of the Senate Republican Caucus. On January 10, 2008 John announced his retirement at a press conference held in Roseville, California. He announced he is not seeking re-election to a tenth term in Congress. This page was last edited on 29 September 2010, at 04:22.